Casseroles... who doesn't love a good casserole in the winter?? Unfortunately most are loaded with pasta and lots of cheese.....neither of which love your waistline...oh wait they do..they stay there...for a long time! Ha! So this month I am on a mission to make some hearty casseroles a little better for you! First up... Turkey & Zucchini with Quinoa. 1. Cook your quinoa according to package instructions. Preheat the oven to 350. 2. While quinoa is cooking, heat a large sautee pan over medium high heat and add the ground turkey. Cook until browned, breaking up into smaller pieces. 3. Move the turkey to the side of the pan and add 2 TBSP of EVOO and add the onion. Cook until softened and then add the zucchini and garlic. Cook for about 5-6 minutes. 4. 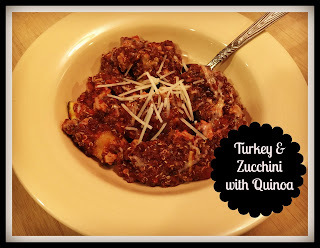 Combine the turkey with onion & zucchini and add the Italian seasoning and salt & pepper to taste. 5. Add the crushed tomatoes to the pan, along with the cooked quinoa. Mix to combine. 6. Pour into a 13*9 baking dish and sprinkle with the cheese. Bake for 20 minutes. You can make this dish and store in fridge for a few days and bake when needed. Just add a few minutes to the bake time to ensure it is warmed through. You can also substitute ground chicken. I hope your family enjoys it as much as ours does!